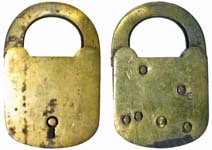 The locks on this page are all Samuel R. Fraim Patent # 907026 and are considered by collectors to be the "Fraim Contract Padlock" series. Blank. 3" high x 2" wide. Cast brass case. Flat brass shackle. Post key. Mfg by: E. T. Fraim Lock Co.
"C N R SIGNAL" - Cast Brass Case. 3" high x 2" wide. Cast brass case. Flat brass shackle. Cast brass dust guard. Post key. Made for: Canadian National Railway Co. Mfg by: E. T. Fraim Lock Co.
"C N R SIGNAL" - Stamped Brass Case. 3" high x 2" wide. Stamped brass case. Flat brass shackle. Cast brass dust guard. Post key. Made for: Canadian National Railway Co. Mfg by: E. T. Fraim Lock Co.
"CW". 3" high x 2" wide. Cast brass case. Flat steel shackle. Flat key. Made for: Clark Witbeck Hardware Co. Mfg by: E. T. Fraim Lock Co.
"D M & N". 3" high x 2" wide. Cast brass case. Flat steel shackle. Post key. 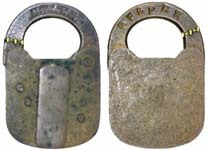 "D M & N" is stamped on the obverse of the shackle. Made for: Duluth Missabe and Northern Railway Co. Mfg by: E. T. Fraim Lock Co.
"DUQUESNE 4 LEVER. 3" high x 2" wide. Stamped steel case. Flat brass shackle. Flat key. Mfg by: E. T. Fraim Lock Co.
"FRAIM" - Banner - Flat Brass Shackle - Flat Key. 3" high x 2" wide. Cast brass case. Flat brass shackle. Flat key. "PAT.DEC.15-1908." is stamped on the obverse of the shackle. 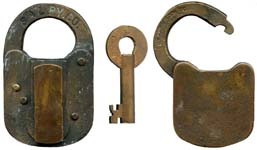 Mfg by: E. T. Fraim Lock Co.
"FRAIM" - Banner - Flat Steel Shackle - Flat Key. 3" high x 2" wide. Cast brass case. Flat steel shackle. Flat key. "PAT.DEC.15-1908." is stamped on the obverse of the shackle. Mfg by: E. T. Fraim Lock Co.
"FRAIM" - Rectangle - Flat Brass Shackle. 3" high x 2" wide. Cast brass case. Flat brass shackle. Flat key. "E. T. FRAIM LOCK CO. LANCASTER, PA. U. S. A." is stamped on the obverse of the shackle. "PAT.DEC.15-1908." is stamped on the reverse of the shackle. Mfg by: E. T. Fraim Lock Co.
"E. T. FRAIM LOCK CO. 4 LEVERS" - Cast Brass Case - Flat Key. 3" high x 2" wide. Cast brass case. Flat brass shackle. Flat key. "PAT.DEC.15-1908." is stamped on the obverse of the shackle. Mfg by: E. T. Fraim Lock Co.
"E. T. FRAIM LOCK CO. 4 LEVERS" - Stamped Brass Case - Flat Brass Shackle - Post key. 3" high x 2" wide. Stamped brass case. Flat brass shackle. Post key. "PAT.DEC.15-1908." is stamped on the obverse of the shackle. Mfg by: E. T. Fraim Lock Co.
"E. T. FRAIM LOCK CO. LANCASTER, PA. U.S.A.". 3" high x 2" wide. Cast brass case. Flat brass shackle. Post key. Cast brass dust guard. Mfg by: E. T. Fraim Lock Co.
"GARDNER". 3" high x 2" wide. Cast brass case. Flat brass shackle. Flat key. Not determined. 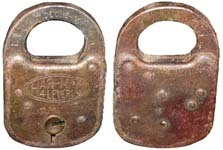 Mfg by: E. T. Fraim Lock Co.
"GROSS" - Flat Brass Shackle. 3" high x 2" wide. Cast brass case. Flat brass shackle. Flat key. Made for: Not determined. Mfg by: E. T. Fraim Lock Co.
"HALL SIGNAL SERVICE" - Flat Brass Shackle. 3" high x 2" wide. Cast brass case. Flat brass shackle. Cast brass dust guard. Post key. Made for: Not determined. Mfg by: E. T. Fraim Lock Co.
"HALL SIGNAL SERVICE" - Flat Steel Shackle. 3" high x 2" wide. Cast brass case. Flat steel shackle. Cast brass dust guard. Post key. Made for: Not determined. Mfg by: E. T. Fraim Lock Co.
"HARVARD 4 LEVER CLEVELAND". 3" high x 2" wide. Stamped steel case. Flat steel shackle. Flat key. Made for: Not determined. Mfg by: E. T. Fraim Lock Co.
"KNAPP & SPENCER 4-LEVERS NON-PICKABLE". 3" high x 2" wide. Stamped steel case. Flat steel shackle. Flat key. Made for: Knapp & Spencer Hardware Co. Mfg by: E. T. Fraim Lock Co.
"KOEHRING". 3" high x 2" wide. Cast brass case. Round steel shackle. Flat key. Made for: Not determined. Mfg by: E. T. Fraim Lock Co.
"KURTZ". 3" high x 2" wide. Cast brass case. Flat brass shackle. Flat key. "PAT.DEC.15-1908." is stamped on the obverse of the shackle. Made for: Not determined. Mfg by: E. T. Fraim Lock Co.
"L & SONS GREENBRIER REGISTERED - Flat Steel Shackle". 3" high x 2" wide. Cast brass case. Flat steel shackle. Flat key. Made for: Lowenstein & Sons. Mfg by: E. T. Fraim Lock Co.
"L & SONS GREENBRIER REGISTERED - Flat Brass Shackle". 3" high x 2" wide. Cast brass case. Flat steel shackle. Flat key. Made for: Lowenstein & Sons. Mfg by: E. T. Fraim Lock Co.
"LEITZ SPECIAL" - Short Logo - Flat Steel Shackle. 3" high x 2" wide. Cast brass case. Flat steel shackle. Flat key. Made for: Not determined. Mfg by: E. T. Fraim Lock Co.
"MORONEY" - Flat Brass Shackle. 3" high x 2" wide. Cast brass case. Flat brass shackle. Flat key. 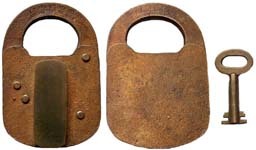 Made for: Moroney Hardware Co. Mfg by: E. T. Fraim Lock Co.
"MORONEY" - Flat Steel Shackle. 3" high x 2" wide. Cast brass case. Flat steel shackle. Flat key. Made for: Moroney Hardware Co. Mfg by: E. T. Fraim Lock Co.
"MORTON" - Flat Brass Shackle. 3" high x 2" wide. Cast brass case. Flat brass shackle. Flat key. "PAT.DEC.15-1908." is stamped on the obverse of the shackle. Made for: Not determined. Mfg by: E. T. Fraim Lock Co.
"MORTON" - Round Brass Shackle. 3" high x 2" wide. Cast brass case. Round brass shackle. Flat key. Mfg by: E. T. Fraim Lock Co.
"NICHOLAS". 3" high x 2" wide. Cast brass case. Flat brass shackle. Flat key. Mfg by: E. T. Fraim Lock Co.
"PEERLESS". 3" high x 2" wide. Stamped steel case. Flat steel shackle. Flat key. Mfg by: E. T. Fraim Lock Co.
"PICKERING". 3" high x 2" wide. Cast brass case. Flat brass shackle. Flat key. Mfg by: E. T. Fraim Lock Co.
"PICK PROOF" - Flat Brass Shackle. 3" high x 2" wide. Stamped steel case. Flat brass shackle. Flat key. "PAT.DEC.15-1908." is stamped on the obverse of the shackle. Mfg by: E. T. Fraim Lock Co.
"PRITZLAFF". 3" high x 2" wide. Cast brass case. Flat brass shackle. Flat key. "PAT.DEC.15-1908." is stamped on the obverse of the shackle. Made for: John Pritzlaff Hardware Co. Mfg by: E. T. Fraim Lock Co.
"P&R SIGNAL SERVICE" - Flat Brass Shackle. 3" high x 2" wide. Stamped brass case. Flat brass shackle. Post key. "E. T. FRAIM LOCK CO. LANCASTER, PA." is stamped on the obverse of the case. Made for: Philadelphia & Reading Railroad Co. Mfg by: E. T. Fraim Lock Co.
"RAYL". 3" high x 2" wide. Cast brass case. Flat brass shackle. Flat key. "PAT.DEC.15-1908." is stamped on the obverse of the shackle. Mfg by: E. T. Fraim Lock Co.
"RAYMER". 3" high x 2" wide. Cast brass case. Flat brass shackle. Flat key. "PAT.DEC.15-1908." is stamped on the obverse of the shackle. Mfg by: E. T. Fraim Lock Co.
"R B & R" - Flat Brass Shackle. 3" high x 2" wide. Cast brass case. Flat brass shackle. Flat key. "PAT.DEC.15-1908." is stamped on the obverse of the shackle. 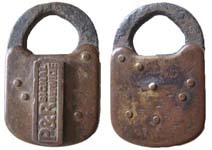 Made for: Reilly Bros. & Raub Hardware Co. Mfg by: E. T. Fraim Lock Co.
"R B & R" - Flat Steel Shackle. 3" high x 2" wide. Cast brass case. Flat steel shackle. Flat key. "PAT.DEC.15-1908." is stamped on the obverse of the shackle. Made for: Reilly Bros. & Raub Hardware Co. Mfg by: E. T. Fraim Lock Co.
"R Co SIGNAL SERVICE". 3" high x 2" wide. Stamped brass case. Flat brass shackle. Cast brass dust guard. Post key. "E. T. FRAIM LOCK CO. LANCASTER, PA. U. S. A." is stamped on the obverse of the shackle. Made for: Not determined. Mfg by: E. T. Fraim Lock Co.
"RF&PRR". 3" high x 2" wide. Cast brass case. Flat brass shackle. Post key. Cast brass dust guard. "R F & P RR" is stamped on the reverse of the shackle. Made for: Richmond, Fredericksburg & Potomac Railroad Co. Mfg by: E. T. Fraim Lock Co.
"SAL RY. CO." - Flat Brass Shackle. 3" high x 2" wide. Cast brass case. Flat brass shackle. Cast brass dust guard. Post key. "E. T. FRAIM LOCK CO. LANCASTER, PA. U. S. A." is stamped on the reverse of the shackle. Made for: Seaboard Air Line Railroad Co. Mfg by: E. T. Fraim Lock Co.
"SEUFERT". 3" high x 2" wide. Cast brass case. Flat brass shackle. Flat key. Mfg by: E. T. Fraim Lock Co.
"STEBBINS". 3" high x 2" wide. Cast brass case. Flat brass shackle. Flat key. "PAT.DEC.15-1908." is stamped on the obverse of the shackle. Made for: Not determined. Mfg by: E. T. Fraim Lock Co.
"STERLING LOGAN-GREGG HARDWARE CO 4-LEVERS" - Flat Brass Shackle. 3" high x 2" wide. Cast brass case. Flat brass shackle. Flat key. "PAT.DEC.15-1908." is stamped on the obverse of the shackle. Made for: Logan-Gregg Hardware Co. Mfg by: E. T. Fraim Lock Co.
"STERLING LOGAN-GREGG HARDWARE CO 4-LEVERS" - Flat Steel Shackle. 3" high x 2" wide. Cast brass case. Flat steel shackle. Flat key. "PAT.DEC.15-1908." is stamped on the obverse of the shackle. Made for: Logan-Gregg Hardware Co. Mfg by: E. T. Fraim Lock Co.
"THE GOLDEN RULE". 3" high x 2" wide. Cast brass case. Flat steel shackle. Flat key. "PAT.DEC.15-1908." is stamped on the obverse of the shackle. Made for: J. C. Penny. Mfg by: E. T. Fraim Lock Co.
"TIKI". 3" high x 2" wide. Stamped steel case. Flat steel shackle. Flat key. "PAT.DEC.15-1908." is stamped on the obverse of the shackle. Made for: Smith Brothers Hardware Co. Mfg by: E. T. Fraim Lock Co.
"TOWNLEY" - Flat Steel Shackle. 3" high x 2" wide. Cast brass case. Flat steel shackle. Flat key. "PAT.DEC.15-1908." is stamped on the obverse of the shackle. Made for: Townley Metal & Hardware Co. Mfg by: E. T. Fraim Lock Co.
"TOWNLEY NO 50" - Flat Brass Shackle. 3" high x 2" wide. Stamped steel case. Flat brass shackle. Post key. Made for: Townley Metal & Hardware Co. Mfg by: E. T. Fraim Lock Co.
"T.T.R. SIGNAL". 3" high x 2" wide. Stamped bras case. Flat brass shackle. Post key. Made for: Toronto Terminals Railway. Mfg by: E. T. Fraim Lock Co.
"UTILITY" - Flat Brass Shackle- Flat Key. 3" high x 2" wide. Cast brass case. Flat brass shackle. Flat key. "PAT.DEC.15-1908." is stamped on the obverse of the shackle. Made for: Norvell-Shapleigh Hdw. Co. Mfg by: E. T. Fraim Lock Co.
"UTILITY" Flat Steel Shackle - Flat Key. 3" high x 2" wide. Cast brass case. Flat steel shackle. Flat key. "PAT.DEC.15-1908." is stamped on the obverse of the shackle. Made for: Norvell-Shapleigh Hdw. Co. Mfg by: E. T. Fraim Lock Co.
"VAN CAMP". 3" high x 2" wide. Cast brass case. Flat steel shackle. Flat key. "PAT.DEC.15-1908." is stamped on the obverse of the shackle. Made for: Van Camp Hardware and Iron Co. Mfg by: E. T. Fraim Lock Co.
"VONNEGUT" - Round Steel Shackle. 3" high x 2" wide. Cast brass case. Round steel shackle. Flat key. Made for: Vonnegut Hardware Co. Mfg by: E. T. Fraim Lock Co.
"WASHINGTON G & D HDW. CO." - Flat Brass Shackle. 3" high x 2" wide. Cast brass case. Flat brass shackle. Flat key. "PAT.DEC.15-1908." is stamped on the obverse of the shackle. Made for: Gray & Dudley Co. Mfg by: E. T. Fraim Lock Co.
"WYETH TRADE MARK WARRANTED". 2" wide. Cast brass case. Flat steel shackle. 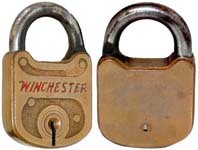 Made for: Wyeth Hardware Co. Mfg by: E. T. Fraim Lock Co.